Three IHS students perform among 320 of the best high school vocalists from the east coast. Indoor Drum Line Wins Championships! The indoor drum line takes 1st place in championship competition. Learn More About Indoor Drum Line Wins Championships! Immaculata High School Spartan Marching Band performed in the Somerville St. Patrick's Day Parade. Learn More About Happy St. Patrick's Day! Only Two Students in the Nation Win the Awards. Color Guard Spring Training Is Now Here! Join the national award winning color guard for spring training. Learn More About Color Guard Spring Training Is Now Here! This year's show is entitled, "The Echo Effect"
The Music Departments' Annual Concert Demonstrates Our Instrumental and Choral Talent. Join us for a night of music! To RSVP (recommended), please click on the Celebration Invite and indicate the number of guests by May 4, 2019. For more information on how to contribute please visit the Celebrating Sr. Dolores Margaret page. Hello and Welcome to the Immaculata Music Department! Learning to play a musical instrument, developing vocal skills and acquiring positive life and study habits are some of the most incredible opportunities that our school can offer your children. They have the power to transform their lives in ways that no other endeavor can. In addition to musical accomplishments, our program is committed to providing young adults with activities that instill pride, teamwork, motivation, leadership, self-esteem, values, respect and recognition of the individual talents and contributions of all members. Our hope is that these traits are then carried forward in all future endeavors. Immaculata High School has had a long commitment to the performing arts, recognizing the important place this type of education provides in the school curriculum. This was recently confirmed by the US Department of Education with the reauthorization of the Elementary and Secondary Education Act which defines the performing arts as a CORE subject. Immaculata is proud that within the Catholic high school curriculum, we are able to offer a complete and comprehensive music program. To our current students, you will find a wealth of information in our webpages to help you navigate through our program. Parents, please take special note of the section just for you. To our prospective students and parents, we hope that you will get to know us a little better. Our program is two-tiered. We start new instrumentalists and vocalists every year. In short, no experience is necessary. Simultaneously, our program challenges those musicians who come to us with years of experience and together our new and veteran musicians travel on their musical journey. 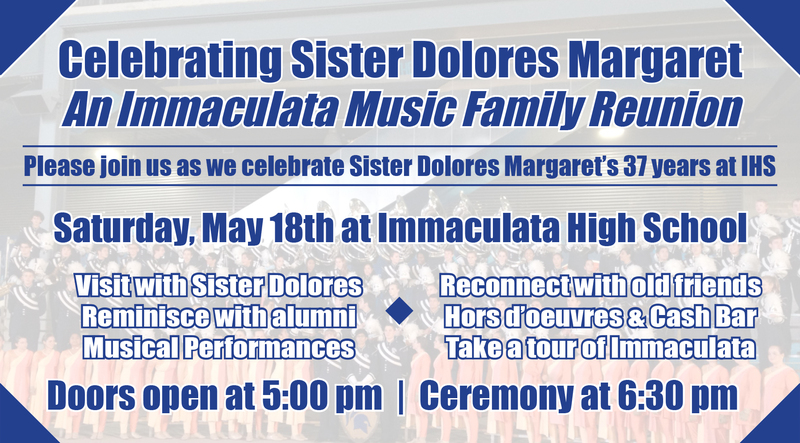 Music at Immaculata can be a life-changing and fulfilling experience with an opportunity to grow academically, create wonderful memories and make lifelong friends. Senior Parents are especially welcome to attend.